I used a pattern from a book called Charmed Knits - it's a book of Harry Potter themed knitting projects (see Currently Reading below). 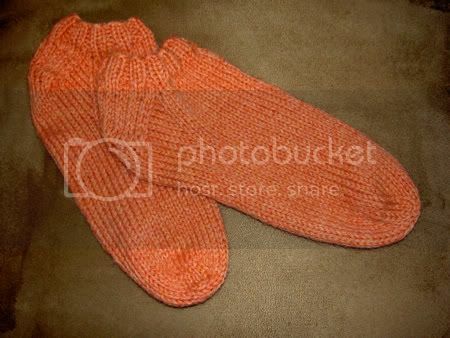 I modified the pattern a bit to make them ankle socks and I used an orange wool yarn instead of Gryffindor colors. So they're not really Harry Potter socks, but the pattern was easy to follow and it saved me having to find a sock pattern online. 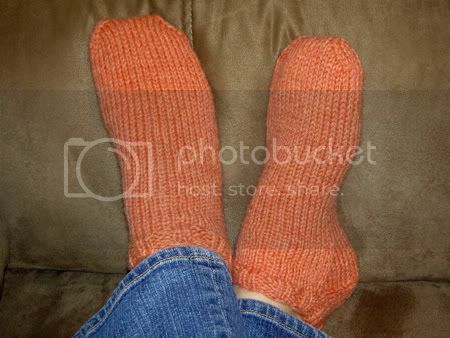 They were much easier to knit than I thought - it probably only took me 3-4 hours of knitting per sock. Speaking of feet, I managed to give myself a nice, deep cut on the ball of my left foot yesterday. I had been sewing curtains for our living room and was standing on the couch to reach the top of the window to see how the curtains looked. When I tried to step off of the couch, I slipped. Unfortunately I had left several old curtain rods at the base of the couch and one had a sharp curved metal piece that was pointing upwards. In my fall I managed to step on it and owww! In addition to cutting my foot, I bruised it pretty good too so it's still hurting. And I mangled the curtain rods so we had to throw them away. Yippee!